All Things SFAB – BG(P) Brian Mennes, Director, Force Management, G3/5/7 provided a quick briefing via webcast on the Security Force Assistance Brigades (SFABs) at the Association of the United States Army (AUSA) annual conference on Tuesday, October 10, 2017. The purpose of the SFABs is to provide a permanent U.S. Army capability to field an advisor force to a foreign country that is already organized, equipped, and trained. The All Things SFAB webcast lasted approximately 30 minutes. The jist of his presentation is captured below. Adhoc Advisor Formations. In order to provide structure to the advisor force in Iraq and Afghanistan Brigade Combat Teams (BCTs) were disaggregated to provide Advise and Assistance Brigades (AABs) to Iraq and Security Force Assistance Brigades (SFABs) to Afghanistan. These adhoc brigades were stripped out of the ‘Joes’ (lower ranking Soldiers) and deployed understrength – sometimes with less than 1/3 of their organic Soldiers and equipment. This, of course, was a very adhoc methodology. The advisor teams were at times untrained and poorly selected – and often lacked critical skills. New SFABs. The Army’s new Security Force Assistance Brigades are a vision to put form to function. The SFABs will professionalize the ability to partner with foreign military forces and will save combat power. The units are broadly organized as a BCT but very rank-heavy. They are smaller, cheaper, more agile. 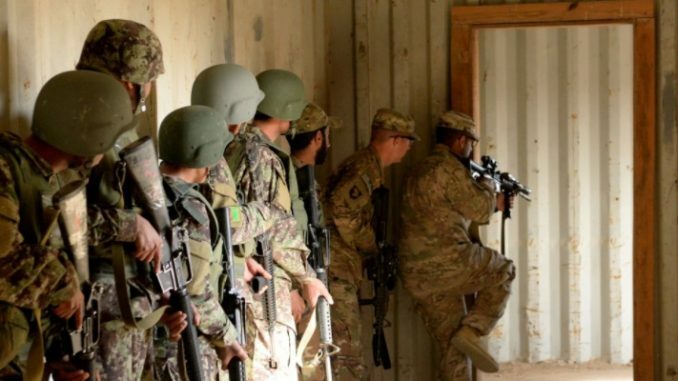 The focus of training will be to produce a unit of advisors that will be a ‘great partner’ to host nation forces who are receiving security force assistance from the U.S.
Organization. Plans are to have five SFABs in the active Army structure and one in the Army Reserves. SFABs will conduct Security Force Assistance; but will can also rapidly grow into a Brigade Combat Team in times of national emergency. It is envisioned that an SFAB can provide as many as 50 small advisor teams when the entire organization deploys. Selection process. The SFABs are looking for physically fit, medically qualified, high-performers, 2nd time leaders, with a propensity to learn. Some officers and senior NCOs will go through a screening board for key SFAB leadership positions. Leadership. Many of the leaders of advisor teams in Iraq and Afghanistan suffered career setbacks due to their tour with a Military Transition Team (MiTT) or Security Force Assistance Advisor Team (SFAAT). For instance, in Afghanistan, many Army LTCs spent their command tour as the leader of 12 or 18 man advisor team when their peers would be commanding a battalion in a combat zone. When it came time for promotion and subsequent assignments the advisor team leader was at a disadvantage. Supposedly, the officer assigned to an SFAB will not suffer the same fate. The plan is for many officers assigned to the new SFABs to have already had their command time. Permanent Organization. The Army plans to keep the SFABs around for a long time. The new organization is here to stay. The Army is creating new lineage with new colors. Replacement for SF Teams? Many observers and critics wonder if the SFAB’s small advisor teams are a replacement for Special Forces advisor teams. The Army says “No”. The U.S. Army Special Forces teams have been over-tasked in theater with a host of missions – one of them providing Foreign Internal Defense or FID. The special operations community can’t possibly field all the training teams needed by the combatant commands worldwide. There is an expectation that the SFAB advisor teams will operate in a similar fashion to a SF team but with a fraction of the training that a Special Forces Soldier receives. The limitations, of course, are obvious – the SFAB advisor teams will not have the regional, language, and cultural experience that SF teams possess. In addition, SF teams are highly-trained in multiple mission sets (not just advising and training) so they are very adaptable to various scenarios. Recent Advisory Experience. In Iraq U.S. military leaders have noted that successful Iraqi units engaged in the fight for Mosul had advisors attached to them. Many of the unsuccessful Iraqi units did not have advisors. This experience solidified the importance of advisors at the tactical level. Recently, the Department of Defense has acknowledged that in Afghanistan the U.S. and NATO advisor teams were pulled off the kandaks (battalions) and brigades of the Afghan National Army too soon. The effectiveness of these formations lacking advisors plummeted within months. The United States is now pushing advisor teams into Afghanistan to re-engage at the tactical level. There is an expectation that SOF and the Security Force Assistance Brigades will work together on training issues. Future Plans. The first Security Force Assistance Brigade stood up this fall. It is probably going to deploy to Afghanistan in the spring of 2018. The Army’s vision is to align units regionally – two for CENTCOM, and one each for PACOM, AFRICOM, and EUCOM. However, the initial SFABs will likely see deployments to either Afghanistan or Iraq.